Blog Travel and subsistence for directors, what you need to know. Travel and subsistence for directors, what you need to know. Travel and subsistence costs are one of the most troublesome areas for business owners and company directors. At PGM we’re here to help, by giving you the run down on travel and subsistence costs. So what exactly is ‘Travel and Subsistence’? 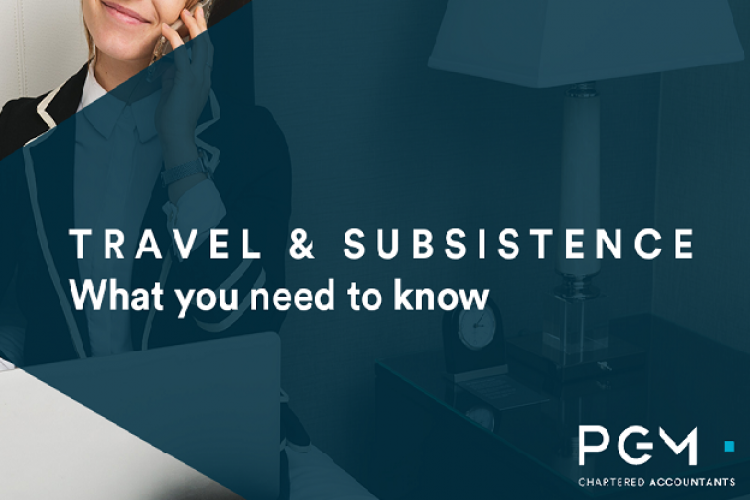 Travel and subsistence is defined as “any accommodation, food and drink costs that you incur whilst you are away from your permanent workplace while working for the company”. These expenses are tax deductible when they are incurred wholly and exclusively for the purpose of your business, trade, profession or vocation. It’s worth noting that food and drink purchased close to your company’s premises does not meet the criteria of ‘work related’. Subsistence expenses can only be claimed under the rules for claiming travel. This means that they must be incurred in direct conjunction with being required to travel for work. The hard and fast rule is that an expense must also be ‘reasonable’. A typical scenario could be claiming lunch on an airport connection or dinner expenses when required to stay overnight at a hotel. Expenditure incurred shortly after leaving home, or arriving home is disallowed by HMRC, as this is deemed a personal choice and not seen as a necessity. Subsistence costs incurred while making client or supplier visits, occasional onsite working or travel to and from events and training courses fits the criteria of allowable travel expenses. However inviting your client for a dinner would be treated as client entertaining and that is specifically not tax deductible. Tracking your travel and subsistence expenses. Gone are the days of frantically trying to find that receipt, wedged in your work diary or hidden somewhere in your wallet or purse to claim that expense. At PGM we offer bookkeeping and digital record tracking, making your accounts preparation more efficient and therefore making your business more efficient. Save time by recording expenses in real time through your smartphone with our digital solutions. Just click here to book a free 30 minute business consultation with our team and learn more about the benefits of our cloud accounting solutions.